I’m always looking for the wine deals; good wines at a good price. It definitely helps to know where to look and Languedoc-Roussillon is definitely one of my go-to regions for wine values. Languedoc and Roussillon are lumped together as a wine region, but these were once independent regions and are actually pretty different in character. (Actually, now the entire region also falls under the larger department of Occitainie, which also encompasses the Midi-Pyrénées in the South West.) Languedoc’s identity is essentially French, whereas Roussillon has had a lot of Spanish influence. Between the 13th and 17th centuries it was ruled by Majorca and by Aragón, and there is a lot Catalan culture as the region is located on the eastern side of the Pyrenees. Spain’s Cataluña is just on the other side of the mountain range. That brings up another difference; Languedoc is mostly coastal and flat, whereas Roussillon is pretty mountainous, as you can probably guess. They also have a really sunny climate with an average of 325 days' sunshine a year and frequent winds, according to Jancis and the Oxford Companion. (At the same time, a lot of the Pyrenees remain snow covered throughout the summer.) Despite all that sun, this region was slow to embrace modernization, even temperature control techniques that can really protect the wine against the effects of all that heat. They’re now making up for lost time and pushing ahead. 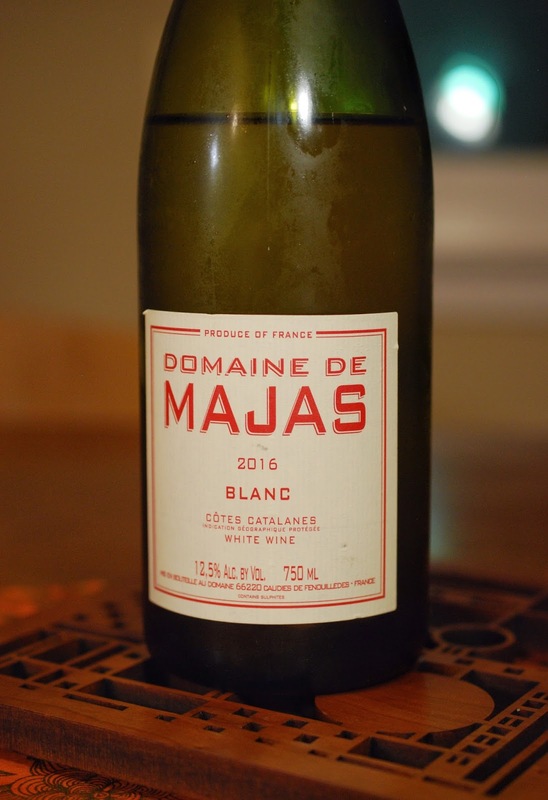 Today’s wine is the Domaine de Majas Côtes Catalanes Blanc 2016 and this Domaine’s story is an underdog story. They’ve definitely had to roll with punches. Most of the wine in Roussillon is still dominated by co-ops and it can be really hard for the “little guys” to survive on their own. For better or worse, the co-ops often dictate how things are be done and they’ve often lead things astray. They also charge high fees. This estate was founded by Alain Carrère and his wife Agnès in 1992. His father had also been a grapegrower in the area before him. Alain decided that selling grapes off to the co-ops was no longer an option. He started his own small estate on 2 hectares of land, but soon inherited over 20 more from his father. This was a blessing and a curse, as it was difficult to suddenly have to sell so much more wine, especially on a local level. He struggled for a long time. Then he struck a deal with a French supermarket chain that offered to buy his entire production. Another double-edged sword. He now had an easy place to sell his wine, but it came with a lot of strings. The supermarket gave strict guidelines on how the wine was to be made and how it should taste–and that was mass market. The wines didn’t have character or a sense of place. Things got worse. Eventually, the bulk prices the supermarket was paying no longer paid the bills. Alain ultimately met and partnered with another winemaker, Tom Lubbe, who was making organic wines at Domaine Matassa. With Tom’s guidance, the estate was converted to organic agriculture. They also reduced the amount of sulfur used in the cellar and eliminated commercial yeast. They put the emphasis on highlighting the terroirs, which are largely schist, volcanic stone, and limestone. 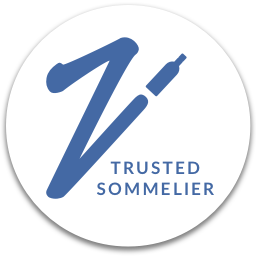 They grow predominantly Carignan, but also Merlot, Cabernet Sauvignon, Cabernet Franc, Grenache, Syrah, Chenanson, Macabeu, Rolle and Chardonnay. Today’s wine is a blend of Macabeu (Macabeo), Rolle (Vermentino), and Carignan blanc. While these grapes might seem somewhat unfamiliar, this wine is a utility player. It’s really easy to drink and very approachable. Greg and I picked up notes of peaches, melon, and herbs on the nose. There were more green notes on the palate with green melon, green apple, white peaches, a little kiwi, and lemon with a hint of the rind thrown in. There was also a little bit of cheese rind, which might be coming from the fact that wine spends sometime on it’s lees. There was a little pavement-like stoniness and more green herbs–Greg called it sourgrass, as well as a little parsley. The acidity was medium/medium+ and it had a lovely rounded mouthfeel. This is a good wine to please lovers of Chardonnay and Sauvignon Blanc alike. This wine could go with any number of things–like I said, it’s a utility player–but I kind of wanted to play with it’s balance of creaminess and fresh flavors. That said, it was also a weeknight and it’s been crazy around here. I thought I’d keep things simple and put a twist on something I’ve made a million times–salmon with a butter sauce (although, I like to extend the butter with olive oil). The best laid plans . . . but we’ll get to that. While I like poached salmon, I also love crispy salmon skin. Often, when I make salmon at home, I sear it on the skin-side first, then poach it in a sauce on the second side. Today this turned out to be my downfall and the skin stuck to the pan. Fine. This also happens with enough frequency that I’ve learned to scrape up the skin when this happens, sear it or broil it separately, then use it as a garnish. On this evening, I did just that: I crumbled it up and tossed it on a hearty salad I made on the side. Sadly, my troubles were not over. When I went to poach the second side of the salmon, the albumen went so crazy white that you’d think I’d coated it in egg white. It was perfectly cooked inside, but it did not look particularly attractive. Oy vey. Greg suggested we flake it all up. I figured it couldn’t look less attractive. I also decided to try to gussy it up with some microgreens I happened to have on hand. On top of that, I’d also roasted some lemon slices to pick up the citrus notes and they did help aesthetically. I really like the flavor of the roasted lemons, however, Greg finds the rinds a bit too mouth-puckering. In the end, it did look better than before we flaked it up, but it was also a little reminiscent of a Fancy Feast commercial. To avoid these problems, you could just decide to not screw around with the skin, remove it, and poach the whole thing. You could also sear the skin separately from the start, or poach the fish flesh-side down and sear the skin under the broiler. If you get to this point where you feel like you have to flake the salmon up, you could always toss the whole thing with pasta. I’d already made a big salad though, and it had gotten late on me, so we decided just to go with it as it was. Ah well. It was still delicious and it went as beautifully with the wine as we’d hoped. It picked up creaminess of the sauce, as well as the lemon flavors. 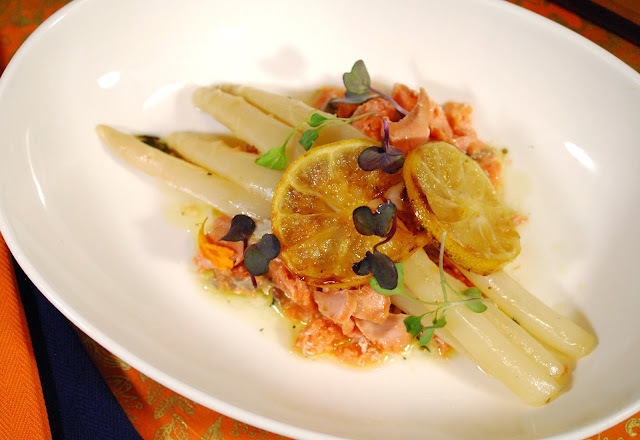 The round texture was good match for the salmon and the wine lightened the palate with its freshness. WineSearcher.com has the average price on this bottle at $17. I picked it up at Bay Grape for about $15. Given its versatility, this makes a hell of a House Wine. Not going to lie. 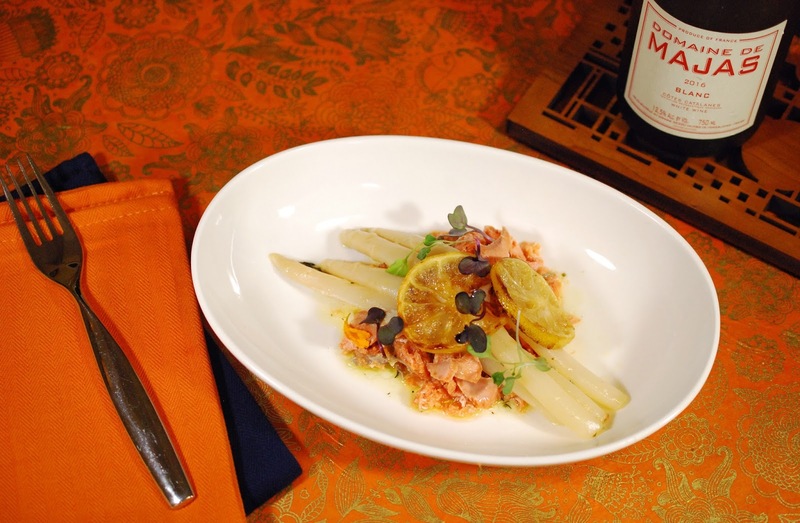 While this made a beautiful match with this dish, any number of whites would work quite well. And like I said, I think this wine would go wonderfully with many, many things. Go and mix it up. Let us know what works for you. Serves 2, but you can easily scale this up by adding more salmon and asparagus. 1. (Optional) Place the lemon slices on a baking sheet. Drizzle with a little olive oil, salt and pepper. Roast in the toaster oven (or oven) for 10-12 minutes at 425°F, until edges are turning brown and crispy. 2. (Optional, if you want to try your luck.) Heat a generous amount of oil in a large pan. Season the salmon with salt and pepper. Add the salmon skin-side down to the pan. Sear until the edges are turning brown. Remove the salmon from the pan and set aside. Note: Like I said up top, you could just decided to not screw around with the skin, remove it and either toss it or sear it separately. You could also sear the skin under the broiler at the end. 3. Wipe out the pan, then return it to the stove top. Add a little olive oil, a splash of the wine, some of the liquid from the asparagus, and the garlic and sweat over medium heat. (You can also add any lemon juice that might have been released by the roasting lemons.) Add in the herbs. Let the liquid reduce down by about ⅔. 4. Turn down the heat to low. Whisk in the butter a tablespoon at a time, as well as additional olive oil if desired. Add the asparagus and poach in the butter mixture until heated through. Transfer to another plate and set aside. 5. Add the salmon to the pan and poach gently until cooked through. If you opted not to sear the skin-side of the salmon, flip and poach on the second side. Altogether, this shouldn’t take more than a few minutes–1 to 2 if you’re just finishing the second side, about 5 total if you’re poaching both sides. 6. 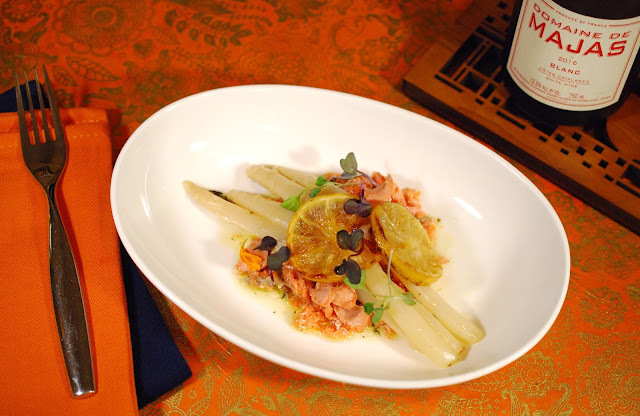 Serve immediately with the white asparagus. Spoon extra sauce over top. Garnish with the roasted lemon slices, microgreens or additional herbs if desired. The French Winophiles meet on Twitter on the 3rd Saturday of every month to chat about wine. Feel free to join us this Saturday 10/21 (8 a.m Pacific Time/11 a.m. Eastern) as we discuss this region by following #Winophiles. And make sure to check out the rest of the great articles from the group! Sorry the crispy skin didn't make it out of the pan. But this dish still looks delicious. Nice job. Sometimes you win, sometimes you loose ;-) It was more all just a comedy of errors! I like how resourceful you were when things kept going awry! Good thinking on your feet, using the skin as garnish. Thanks -- always trying to roll with the punches. I feel you on the red CDR wines. Funny thing though, typically when I do get around to a white Rhone blend I ask myself why I don't drink it more often! Sounds and looks like a delight food and wine pairing! Thanks for sharing!